Mezze is the Middle Eastern version of Spanish tapas. Aside from the elevated flavours of mezzes, most are served at room temperature and this makes them a perfect choice for entertaining crowds, as many mezza can be prepared ahead of time such as hummus, mutabal, beetroot dip, kishkeh, fasoulia bil zait, lib kusa, kibbeh and many others. Mezzes were my grandmother’s favourite. Little did I know when I was a child that it was because she was vegetarian. She loved them all with passion and passed on that passion to us. Lubieh bil zait is a vegetarian mezze which I used to eat a lot at my grandmother’s. It is a dish that my father made a lot in celebration of his love for her…and now it is a dish that I make in celebration of my love for them both. Dad if you read this, I want you to know I miss my kitchen-mate so much and can’t wait to see you again. 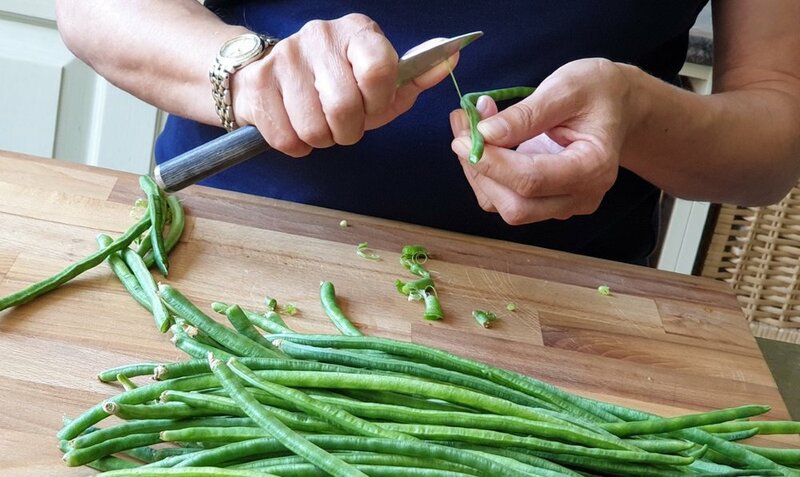 Lubieh is the Syrian word for “snake beans” and is not be mistaken for the Lebanese which means “green bean”. This recipe is a true interpretation of healthy, quick and easy. It consists of five ingredients yet carries so much flavour and screams deliciousness despite its simplicity. It is a summer dish and is traditionally eaten by hand using flat bread as a vessel to fill in morsels instead of a spoon accompanied by plain yogurt. * Wash and pat dry the beans. * To devein, hold the end of the bean between the blade of a knife and the thumb. Cut the tip half way then pull the tip downwards the seam of the bean and pull the fibrous string away. * Cut the beans in about 6 to 7 cm in length. 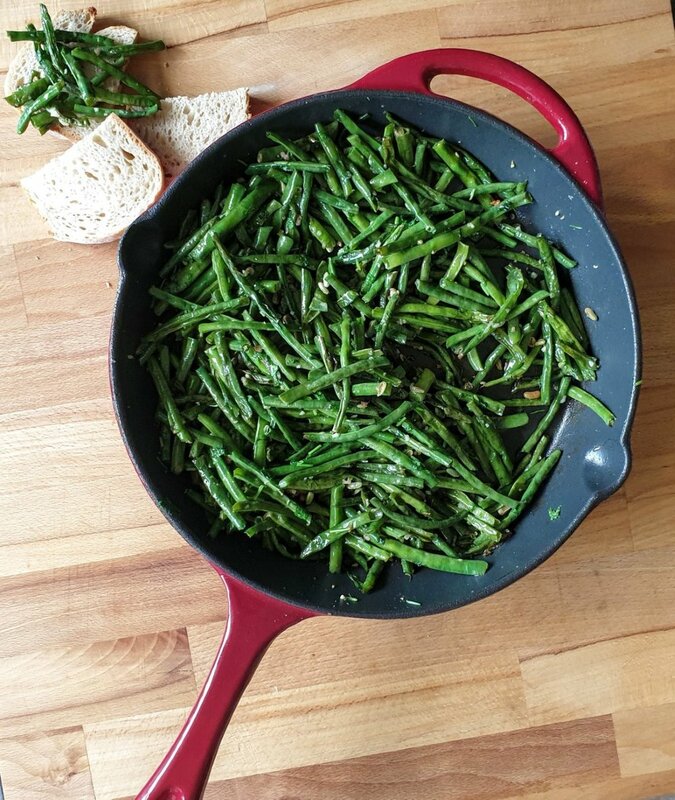 * Heat the olive oil in a cast iron skillet and add the beans. * Season with salt and cook on medium heat turning every now and again around 10 to 15 minutes until they start to brown slightly. * Toss in the crushed garlic and coriander for a couple minutes. * Adjust the salt and serve warm or cold with bread and plain yoghurt. * Choose tender and thin snake beans for best results. * If you are in a rush you can add a little water and cover it. This will speed up the cooking time, but you will be left with a slightly soft, dull and mushy texture. * Adding salt immediately helps keep a fresh green colour. Per Serving: 149 Calories; 10g Fat (57.7% calories from fat); 3g Protein; 14g Carbohydrate; 6g Dietary Fiber; 0mg Cholesterol; 12mg Sodium.